Hi, I'm absolute beginner playing any instrument so my question might seem silly to some. Also not sure if I'm in right topic? 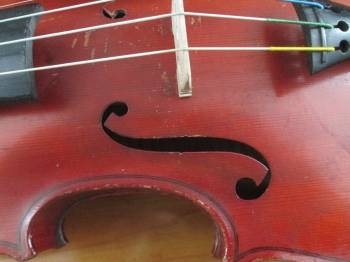 I recently purchased a gliga genial 1 (left handed) violin and I noticed the sound post is 3/8" back from the center of the bridge foot to center of sound post, and from what I've read its not in the right location. It looks like it hasn't moved at all its in perfect vertical position. Since Gliga hasn't answered any of my emails figured I try here. 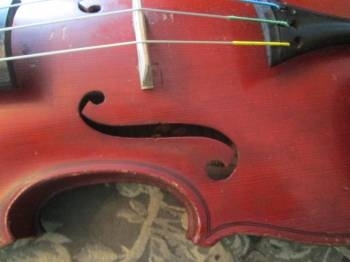 Would a luthier have placed it in this position for this particular violin, unfortunately there's no place nearby I can take it to get it checked out either. I noticed the sound post is 3/8" back from the center of the bridge foot to center of sound post, and from what I've read its not in the right location. It looks like it hasn't moved at all its in perfect vertical position. From your description, there is about 6 mm of space between bridge and soundpost, edge to edge. It might be a little far back, but I think probably that is within a normal range, not far off. Unless I am wrong, the distance is usually described edge-to-edge. But we have folks who know more about it than me. Just a quick question before you start trying to move your sound post: are you SURE the bridge is in the right spot. It's pretty likely that the bridge could have slid a bit during tuning or something. "For best results.." measure the distance from nut to bridge, edge to edge and make sure that is correct. THEN worry about where your sound post is at. I just beginning so I wouldn't move anything until I was completely sure what to do beforehand. I checked bridge its in its proper location. Thank you very much for your reply and advice, it is very much appreciated!!! It's hard for us to envision the real distance when you refer to the center of the bridge foot and center of the sound-post because we usually talk about the space between. Normally luthiers will begin with a distance of about half the thickness of the sound post space behind (towards the end button) and centered to the E string bridge food side. The closer you get to the bridge the more power but less action. And the opposite for moving it away from the bridge. Same thing with the tightness of the soundpost. If the sound-post is too tight it dampens the sound. Too loose, you get less power but plenty of easy action. Often you play around with the positioning and come to a sweet spot. By the way fiddlerman you sure can play, I listened to you play a classical piece (testing violin) WOW!! helluva player!!! Try to call ahead and find out whether anyone in the shop knows anything about violins. If it's not a violin shop, they may know less about it than you do, and you might end up with less money and a violin that plays worse. Sounds like it's pretty much right to me. How is the sound? Is it easy to play? Yes, a luthier would easily have placed the sound-post in that position and RU has a good point. 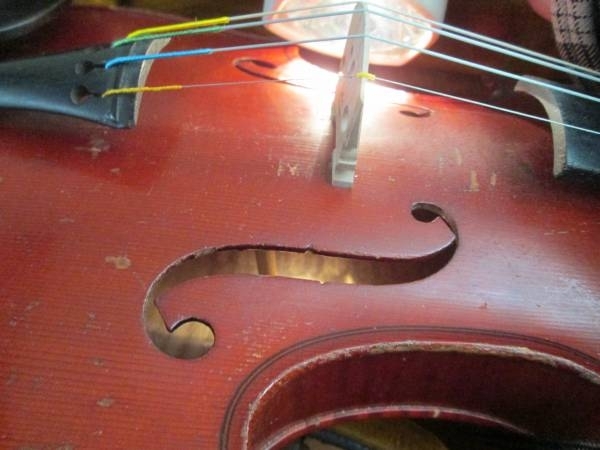 Just because they sell violins doesn't mean they know anything about setup and adjustment. Ok all this talk of sound posts got me to wondering about Berty's. When the luthier repaired Berty I had not purchased strings. 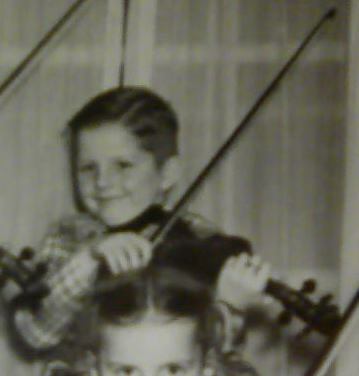 When I did finally buy strings we compared Berty with my son's $60-90 ebay violin and her very, very expensive violin. My D and A string are very comparable to her violin. Berty has a much richer and "blooms" compared to my son's violin. We did not try the G and E strings. When I tune using an electronic tuner - every string of Berty - the needle hits and stays on tune for a length of time. With my son's it fluctuates widely back and forth. I can play it very loudly and very softly - is that what you mean by easy to play? The space measures at 15mm? Or is my bridge out of place? Your bridge appears to be about a bridge thickness to far forward and your soundpost appears to be slanted and slightly to far back. Thanks Fiddlerman and all those on the chat! What a great group of people!! I am so close to moving the bridge myself lol!! AARRGGHH!! Can I wait until Jan 15 when I see teach and have her do it? Do I have $$ to replace it if I break it? At this point in time, knowing you will go to the "city" and perhaps there find an expert to have a look at it... I would venture a guess you have nothing to loose by gently but firmly grasping the bridge with both hands and placing the violin in your lap with the tailpiece against your body, sliding the bridge back about a "thickness" distance as FM has mentioned. I doubt the post is slanted as the picture appears to be distorted as the bridge looks like it's leaning the opposite direction in that same picture. After you move the bridge, check the tune and then play it and see if it sounds better. If it does and you're happy with it, no trip to the city is required but if it still sounds like there's more there to be had, then your input to the luthier will be appreciated since he would then have one direction that didn't make it sound better. At that point, they will most likely adjust the post since moving the bridge forward more (back to your original position) made it worse. Here's a very good video explaining the ease of moving your bridge, or resetting it if it has fallen over. The tone is brighter. I swear the E string is definitely blooming now! I did it, I did it. Happy dance!! So, when ya gonna build one from scratch now? Here are some interesting video's on basic violin care and what to look for in your instrument. This one happens to be on our sound post and when to adjust it. You can search Youtube for more videos like this.